There are moment in a blogger’s life where you have to pinch yourself and think “Is this really happening to me?”. As I write, I feel like this post is probably one of the highlights of this little pursuit of mine. Before I started blogging, I would regularly visit Bee’s blogs, Rasa Malaysia and Nyonya Food. If you asked me what inspired me to start this blog, in all honesty I would say that with each visit to Bee’s blog I would be more motivated to start my own. It’s not hard to see why, her blog celebrates the beauty of Asian cuisine. Her gorgeous photography entices you to want to re-create her dishes at home and guess what – they are all easy enough to do so without losing any of the cuisine’s authenticity. It was only by chance that Ellie introduced me to Bee and luckily this chance encounter led to this post! I am so grateful to Bee for giving me the opportunity to guest post on her site and to share one of the Philippine’s most loved dishes. 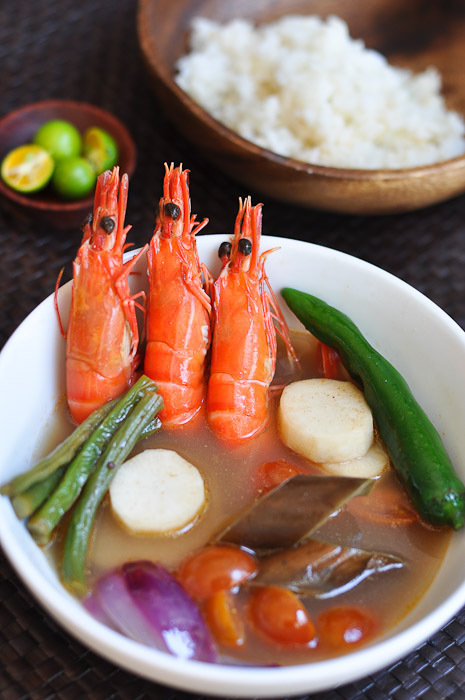 Shrimp Sinigang (Sinigang na Hipon). Please visit Bee’s site Rasa Malaysia for a short introduction to this dish and the recipe. Interesting version of sinigang, I never tried sautéing and adding sugar to my sinigang. Congratulations for the very informative and excellent presentation of sinigang , thanks to Bee continually featuring Pinoy Food and Pinoy Food Bloggers to Rasa Malaysia. Seriously, that is the most beautiful photo of sinigang I’ve ever seen. Just sayin’. Waw, Trissa!! This dish looks so appealing, appetizing & lovely too! Kisses from Brussels to you! Congratulation on you Rasa Malaysia feature. This is the first time I hear of sugar being added to sinigang. Is this a Tagalog thing to always add sugar to savory food? Us Visayans could never understand this sweet dimension popularized in Manila and neighboring provinces. Hi Alexie – thanks for dropping by. The sugar is something I added myself – it’s something a lot of people in my family would do too… not entirely sure if filipinos do this generally but I thought it added a nice touch to the dish. Think of all the filipinos that add sugar to their spaghetti! Weee.. a guest post for Rasa Malaysia! Heading over now to check it out. Congrats! Love Bee’s blog too! This looks so scrumptious. I have never cooked with this kind of shrimp, but have always wanted to. I bought some frozen and will be doing some cooking with them, soon. Of course, they are better fresh – but, I think I will practice, first. Great combination of flavours trissa…heading over to see Bee’s blog. I am not usually a soup person because I feel that things often get cooked to death in them, but this is not the case with your soup. All those lovely bright colours show how fresh and delicious this is. Congrats on your guest blog. They say you should never meet your heroes, but it seems to have been a positive experience in this case! Congratulations on your guest post! Isn’t is amazing what food blogging can lead to. This dish looks so beautiful and colourful. Wonderful flavours, too! Congrats Trissa! It’s beautiful dish. Bee should really start a Rasa Malaysia Alumni. LOL!! Ah this shot is beautiful and appetizing. Heading over to check out the post now :). Aww congrats on the guest post! those prawns look so perfect. Congras! I, too visit Bee’s blog for inspiration at times. Trissa, Bee’s blog is so attractive and one of my favourite blogs that I visit everyday. Congrats on your guest post!